Our abbey is named for the beloved Mexican shrine of Guadalupe, whose traditional story we here present. More recent shrines, such as Lourdes, have had a standardized story from the outset, thanks to modern means of communication, but in early Mexico such standardization was impeded by great diversity of languages and separation of social classes and rivalries even within those classes. Thus the Guadalupe story, like that of Jesus Himself, was initially transmitted only orally and in a variety of settings, and was put into writing, as print, only after many decades. In fact, in the 1940s a Mexican historian highlighted this fact by paralleling four early accounts of Guadalupe with the four Gospels of the New Testament. What is presented here is the second of those Guadalupan accounts, published in the Nahuatl language of the Aztecs by the second of these four “evangelists,” Luis Lasso de la Vega, who was chaplain of the shrine from 1647 until 1657. Here at the abbey our Fr Martinus Cawley has spent many years studying the early literature and is currently preparing a book on the formation of its tradition for the University of New Mexico Press. As a study aid for readers of that book, he plans eventually to mount scholarly translations of all the early accounts on the Web, beginning with this one, which is currently the most popular. It is generally known from its opening words as the Nican Mopohua. Being in the Nahuatl, the Nican Mopohua received little attention until critical historians of the Enlightenment began to question the tradition and apologists used this text to refute their doubts. Only in 1926 did it become really popular, when an excellent Spanish translation was published by Primo Feliciano Velázquez. And only in the 1940s were its literary and theological beauties appreciated, thanks to the work of the great linguist, Angel Garibay K.
Garibay distinguished two literary styles in the Nican Mopohua, one exquisitely eloquent and the other rather more prosaic. These correspond to two manuscript accounts copied back in the 1620s by another fellow university student of Lasso’s, the linguist and mathematician, Luis Becerra Tanco. When Lasso became chaplain he borrowed Becerra Tanco’s copybooks to use in publishing the story. In 1666 Becerra Tanco himself was persuaded to become an evangelist of Guadalupe, and in the three surviving drafts of his own account he names those twin sources el cantar and la historia (“the ballad” and “the story”). By “the ballad” he meant a paraphrase of a rhythmical song chanted by elderly Indians to accompany an annual dance in the plaza of Guadalupe, in which they told of the Miracle of the Roses and of Tilma and also of the installation of the scared image at the newly built shrine. By “the story” he meant a most eloquent account of dialogues in which Our Lady asks Juan Diego to get the Bishop to build her a shrine, and goes on to assure him that she has healed his uncle of a serious illness. Becerra Tanco had repeatedly witnessed that annual dance during his student days, and a priest uncle of his had heard the eloquent dialogues a generation or two earlier. Becerra Tanco had copied them, along with many other Aztec texts, while preparing for a language-teaching job at the university. 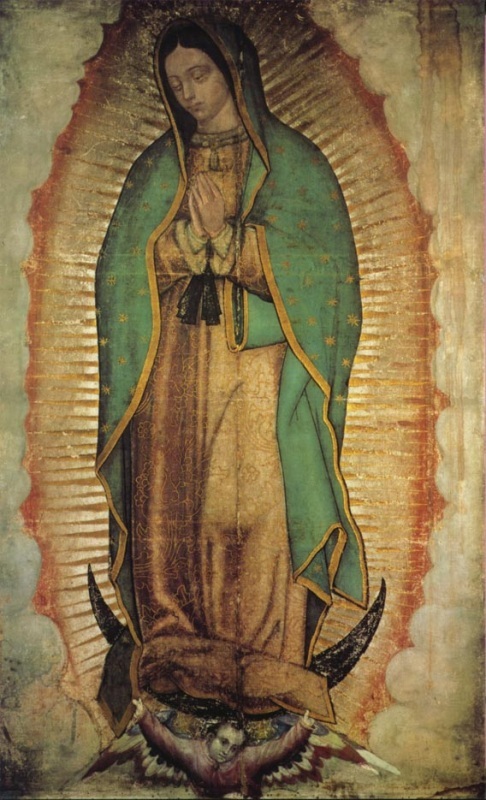 Mother of God and Our Queen, over at Tepeyac, which is referred to as Guadalupe. She first revealed herself to an Indian by the name of Juan Diego, and afterwards there appeared Her Sacred Image in front of the late Bishop, Don Fray Juan de Zumárraga. Him Who is the True Divinity, God Himself. but in things divine he belongs entirely in Tlatilólco. in the area named Tepeyác, already Dawn is brightening. as if for the hill itself to answer. is their song, surpassing that of the Shrill bird, that of the Bellbird, that of every other kind of Lovely Songbird! “Could it be that I be worthy? Could it be that I deserve what I am hearing? Is it that I am dreaming? Is it that I am sleep-walking? Where am I? Where indeed do I seem to be? towards the Region of the Sallying Sun, whence sallies forth also that heavenly, lovely song. Then ventures he to make his way up whither he is being called. Nothing of disturbance is in his heart, nor any stunning shock. Rather is he full content with it all, full glorying in it all, as he clambers up the hillock, whither he has been gazing and whence has been coming his Call. he catches sight of a Woman, One Who has been taking Her stand there. She beckons him to come on, closer up to Herself. Her Garments are as the Sun, gleaming, glittering. Even the boulder, the crag, on which She takes Her stand sparkles in Resplendence, like fine Emerald Jade on a Bangle when it shines, like the swarming Glow of a Rainbow in the Gloom. up every stalk and twig and thorn. One Whose Attitude is esteem. Forthwith She informs him, She presents to him Her Sacred Wish. My Littlest One, that I Myself, I am the Entirely and Ever Virgin, Saint Mary, Mother of the True Divinity, of God Himself. Because of Him, Life goes on, Creation goes on; His are all things afar, His are all things near at hand, things above in the Heavens, things here below on the Earth. How truly I wish it, how greatly I desire it, that here they should erect Me My Temple! their each and every kind of disappointment, of exhausting pangs, of bitter aching pain. in My Regard for My Needy Ones, do you, please, go to the Palace of the Bishop of Mexico; go and tell him how it is I Myself who am commissioning you that you should present to him how strongly I desire it that here he should house Me, that here, on the level ground, he should erect My Temple. and wondered at and of whatever you have heard. to procure what I am commissioning you to do. at once he headed straight for the Palace of the Bishop. a priest of Saint Francis. someone did come out and call him in, for the Lord Bishop had given orders that he enter. When he reached the Presence of the Heavenly Woman, at the Place where She had first appeared to him, there She was, standing and waiting for him. “My Sovereign, Milady, O Woman, My Littlest One, O Maiden, I have been to where You commissioned me that I go and realize Your utterance, Your Declaration. Your Declaration, just as You had bidden me do. as if he made of it less than the Truth. let it be he that bears it, that carries it, this Utterance, this Declaration of Yours, that it be believed. for it is not mine to set foot there, there where You bid me to go. My Declarations, or that they should realize My Wishes. that it be done, this Will, this Wish of Mine. you go and visit the Bishop. the Temple for which I am asking. “My Sovereign, O Woman, My Maiden. Let me not trouble Your Countenance, Your Heart; for indeed with all my own heart I shall go, I shall go and realize Your Utterance, Your Declaration. By no means shall I leave it aside or reckon the road laborious; I shall go, I shall go and do Your Will— Though I well may not be listened to in goodly mood, and even if I am listened to, I may not be believed. when the Sun is entering its Home, I shall come and bring back Your Utterance, Your Declaration, with whatever the Priestly Chieftain shall have answered me. And forthwith home went he and took his own rest. and straight he headed for Tlatilolko, There to learn the Things Divine and to be counted on the Roll and, after that, to visit the Priestly Chieftain. he immediately went towards the Palace of the Lord Bishop. When he reached it, he made every effort to get to see him and did, after much difficulty, get so to see him. undertake to erect Her Temple, there where She had indicated, where She had wished. and inquire about before his heart could settle itself: where it was that he had seen Her, and after what manner. this Signal you are asking for? Forthwith I shall go, I shall go and request it of the Heavenly Woman Who commissioned me hither”. as the Truth and was not at all embarrassed or taken aback, simply sent him along. and should keep on the lookout as to where he went and whom he saw and accosted. the Road of Return, whilst they were following along behind him. in the neighborhood of Tepeyac, and where there is the Wooden Bridge, they lost him. Though they searched everywhere, nowhere did they see him. and had kindled their wrath. and was barely awoken from sleep in whatever he had been there to request. that if ever he came along again and returned, there and then they would seize him and sternly chastise him, that he never again go telling lies and deceiving like that. something of a Signal that he might be believed, he did not in fact return again. and it was indeed worsening. and things had worsened indeed. that he come over to hear his Confession and to prepare him. to call in a Priest from over at Tlatilólco. and will again come and detain me for me to carry something of a Signal to the Priestly Chieftain as he has given me orders to do. on the side of the Sallying Sun. She who is so able to see in all directions. from which She had been gazing on him all along and upon which he had earlier been wont to see Her. She came and halted him. “So, My Littlest One, whither are you going? And himself! Will he not be a little embarrassed? Will he not be perhaps abashed? Will he not be perhaps shocked? Filled with awe? Before Her Countenance he prostrates himself and salutes Her. Contentment Be Yours! How has felt the Dawn upon Your Countenance? How feels the Health within your Lovely Flesh? and presently he shall be dying of it. we have to be on the watch for the travail of our Death. I shall then head back here again and shall go and shall bear Your Utterance, Your Declaration, Milady, My Maiden. But do pardon me, and bear with me in all patience, for I am not deceiving You, My Littlest One, My Bairn. do be assured of it in your heart, My Littlest One, that nothing at all should alarm you, should trouble you, nor in any way disturb your countenance, your heart. nor of any other pestilence, nor of any other pestilence or any rasping hardship. For am I not here, I, Your Mother? Are you not in the Cool of My Shadow? in the Breeziness of My Shade? Is it not I that am your Source of Contentment? cuddled in the Crossing of My Arms? Is there anything else for you to need? Nothing else, though, should trouble you, should disquiet you. And do not let it trouble you, this Pestilence of your Uncle’s, for he is not going to die of it now. this Declaration of the Heavenly Woman, he was greatly heartened, his heart well content. as a proof whereby to believe in him. climb up to the top of the hillock, where She had earlier been revealing herself. for this was when the Frost is severe. with nocturnal Dewdrops like precious Pearls. and put into the fold of his mantle. took them up in Her Own Hands and again delicately replaced them in the fold of his mantle. that in them he should see My Wish, My Will. should you unwrap your Tilma and show what you are carrying. and go about picking these Flowers. of those varied Garden Flowers. and sundry Domestics of the Chieftain Priest. and all made as if they did not wish to hear him. by his importunate hanging around. when they had been following along behind him. So for quite some delay he stood there, waiting for word. to get a look at what he might be carrying, just to satisfy their hearts in passing. he did let them glimpse that it was Flowers. When they thus saw that it was lots of varied Castilian Flowers and that it was not then the season for them to grow, they greatly marveled at that, and also at how fresh they were and how blooming and how fragrant and how wonderful. and to grab them for themselves. it would no longer be Flowers they were seeing but, as it were, a painting or an embroidery or something sewn on to the Tilma for them to see. in his waiting for word about this desire to visit him. what the little fellow had been soliciting. so as to visit him. and marveled at and all about his commission. there where She had requested it of you that you erect it for Her. as a proof of Her Wish, for you had left it thus in my hands. that you should be asking something of a Signal, a Proof, so that Her Wish might be done and realized. for me to be believed, just as She had told me She would be giving me. sending me to the top of the hillock, where I had earlier been wont to see Her: I was to go and pick varied Castilian Flowers. and then placed them again in the fold of my mantle, so that I might myself bear them hither to You. all spikes, all thorn bush, all prickly, all brambles. Not that I was taken aback! Not that I wavered! of the Garden Flowers of Castile, with the Sun gleaming on their Dewdrops. And so I went ahead and picked them. my own commission, might be apparent. even now, it is so reverently kept, over at Her Sacred Dwelling, at Her Temple entitled Guadalupe. their hearts and thoughts aloft. he came and established it in his Oratory. who, of course, detained him. to visit his Uncle Juan Bernardino. to hear his Confession and to prepare him. that he had already healed up. But now they would not let Juan Diego go away alone. They escorted him right to his home. and how he had healed up and how he was no longer sick at all. and being treated with such honor. He inquired of his nephew why the likes of this was being done, this treatment of him with such honor. and see the Lord Bishop in Mexico City, that he might set up a House for Her there at Tepeyac. And how She had also told him not to trouble himself, inasmuch as his Uncle had already healed up, and how he had been greatly heartened thereby. that it had been then that he had healed up, and that She had revealed Herself to him also, in exactly the same likeness in which She had been revealing Herself to the nephew. he would present to him and inform him of what he had seen. 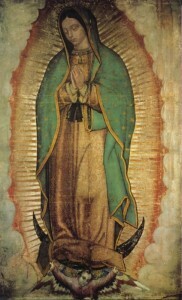 – as indeed it ought to be entitled – the Ever Virgin Holy Mary of Guadalupe. into the presence of the Lord Bishop for him to give information and to testify before him. Then, along with his nephew Juan Diego, they housed him in the Bishop’s home for a few days. for the Sovereign Woman over at Tepeyac, where She had revealed Herself to Juan Diego. and marvel at so Sacred an Image. For indeed this whole City, one and all, was astir and was visiting and marveling at Her Sacred Image, doing it homage and making prayers before it. who had painted that Sacred Representation.